Hello and welcome back. 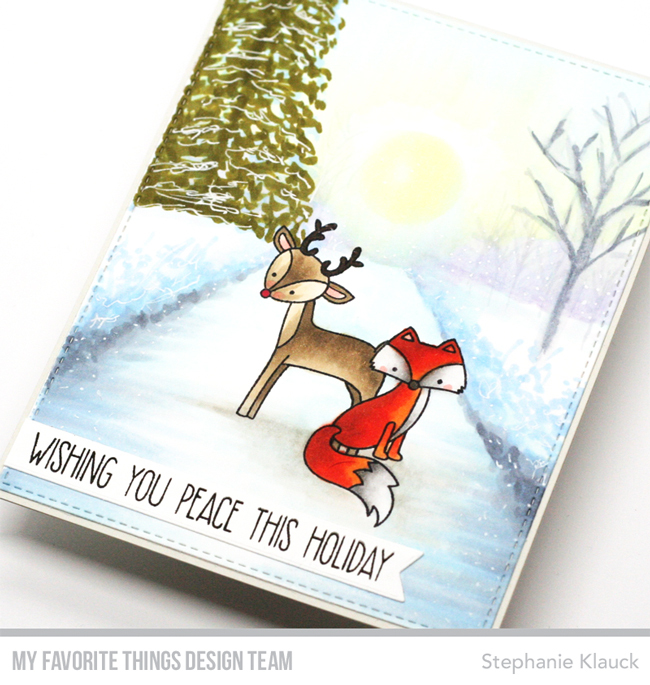 Today I have a card to share that I created for the newest MFT sketch challenge. I love using the sketches as inspiration for my cards - I love having a general foundation to start with when I start creating. For my card, I decided to use a cloud edge for the scalloped border and added images around the sentiment strip in the center. 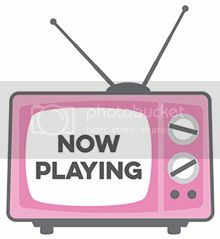 To create the background I first added inked cloud edges to the top panel with distres ink and then I used the Mini Cloud Edges Stencil to diecut it. I used the Drift and Hills stencil on the bottom panel to create grass hills and then I layered them both onto a Grout Gray card base. 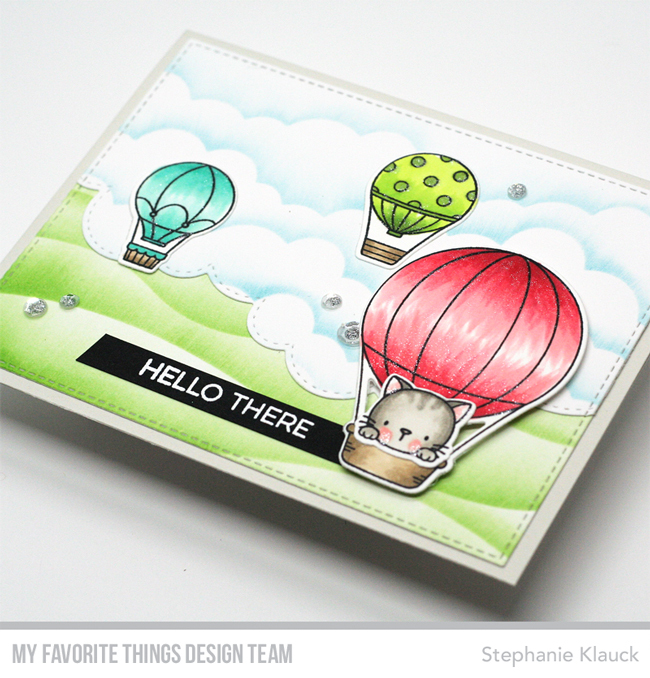 I stamped three hot ariballoons from the Up in the Air stamp set along with the kitty images. coloured and die cut them all and then added them to my scene. I then stamped anf heat embossed the sentiment and added it tucked under the largest balloon. Hello and welcome back. 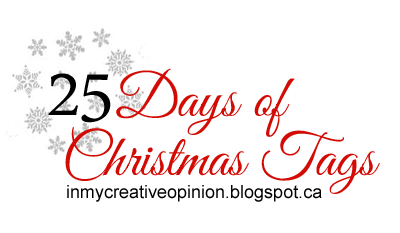 Today I am taking part in the 25 Days of Christmas Tags hosted by my awesome friend Tracey McNeely! I'm sharing a tag along with Muse Christmas Visions who are the sponsors for today! For my tag today I used two stamp sets from Hero Arts - the Poster Christmas Carols (one of my favourite holiday sentiment sets this year!) and the Winter Time Fun stamp set. 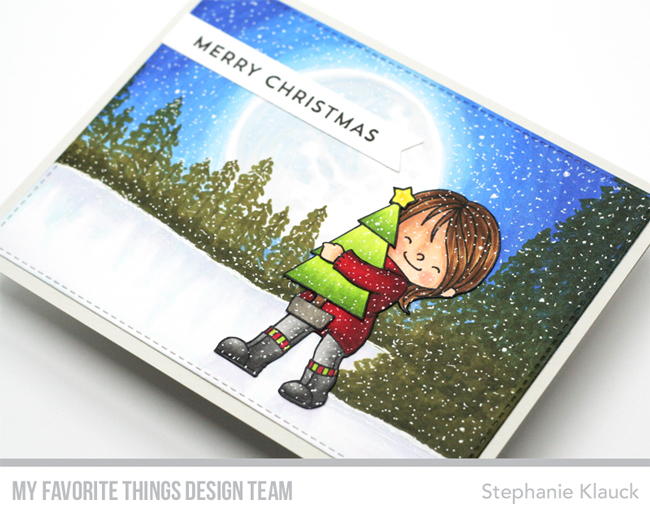 I wanted to create a little winter scene with falling snow on the entire tag including the top of the sentiment. I stamped out the scene on a white tag I diecut with the Neat and Tangled Classic Tag die and then I added my sentiment in the open area near the top. I coloured it all in with Copic markers and used a white gel pen to add the snow detail. 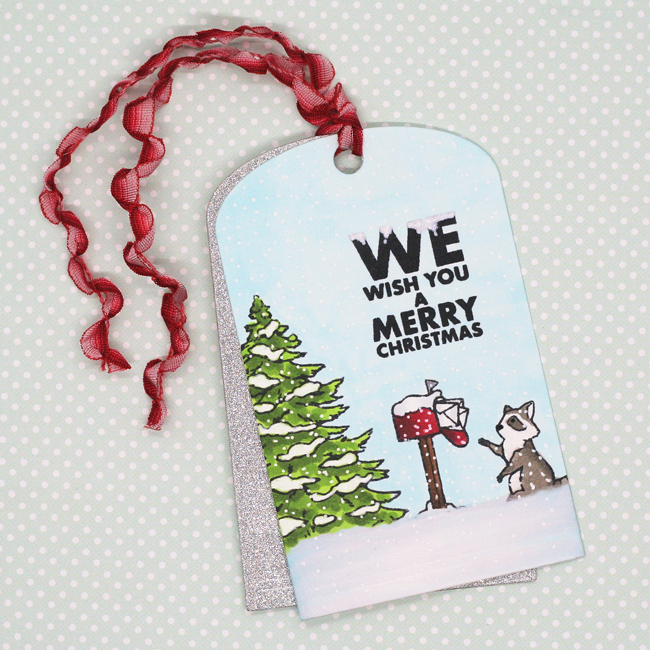 I added a silver tag in behind it and then I added some fun red ribbon so it can be tied to a gift. Make sure to visit Tracey's blog to see more tags from today's sponsor and to enter the giveaway! Hello and welcome back! 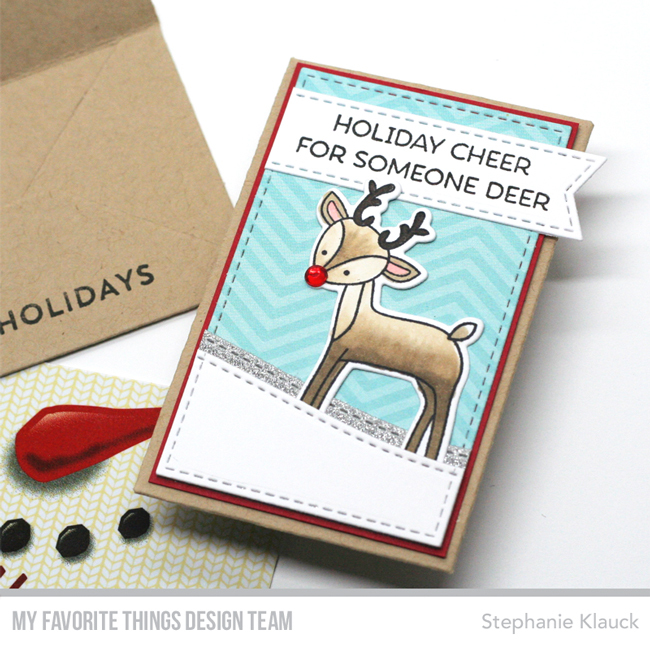 In today's post, I'm sharing a card that I created using products from the November release from My Favorite Things. 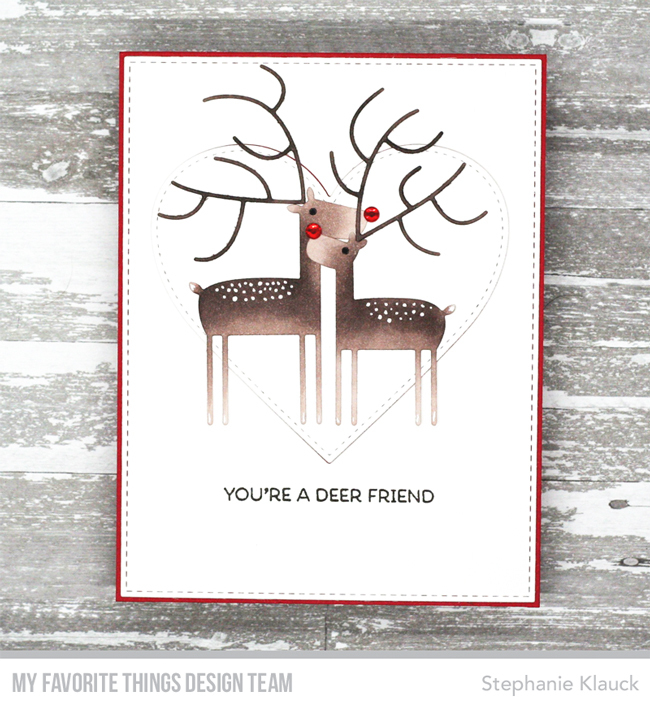 I love the new Deer Love Die-namics and knew I wanted to use them together on a card with a heart in the background. After I die cut the white heart, I actually embossed it with the Abstract stencil, but the textured detail doesn't show in the photos. Using a stencil to emboss a card stock piece is a great way to add subtle dimension. I die cut the heart from a white panel that I had die cut with the largest die from the A2 Stitched Rectangle STAX Die-namics, and then I adhered the panel onto a red card base. Before adding the embossed white heart, I glued 3 red hearts (one on top of the other) inside the die cut opening to add some dimension with a bit of red showing from underneath. I die cut both of the deer and the antlers from white card stock, and then I used Copic markers to colour them both. I added white dot detail to their backs with a white gel pen, and then I adhered them both to the heart. I added red gems to their noses and used a black marker to colour in their eyes. I finished the card by stamping the sentiment from the Deer Friends stamp set under the focal images with black ink. Make sure to head over to the MFT blog for more ideas from the design team using the new November products. My Favorite Things November Release | New Product Launch! Hello and welcome to the My Favorite Things November release party! 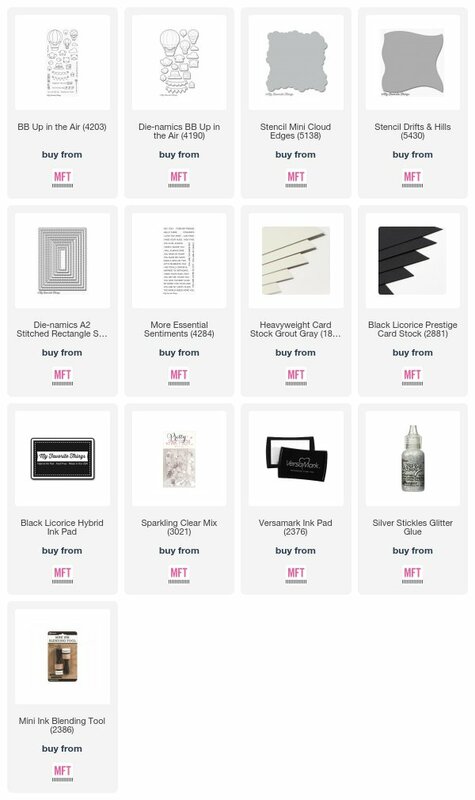 All of the products we've been sharing online all week are now available in the MFT Stamps online store. I created a simple background with come chevron patterned paper from the Calm & Cozy paper pad cut from a stitched rectangle and then I added a silver glitter and white snow hill to the bottom. 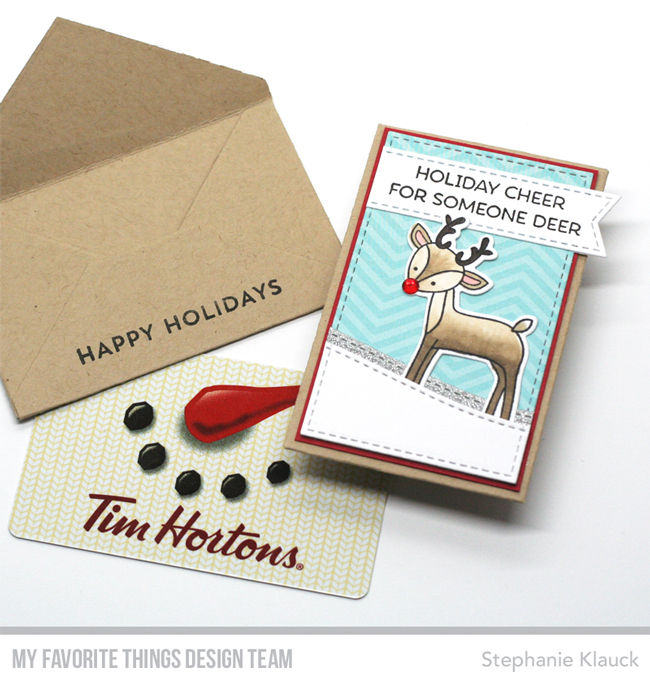 I stamped and coloured the deer and die cut him with the coordinating die. I stamped a sentiment from the Deer Friends stamp set onto a Stitched Fishtail Sentiment Strip, and then I adhered that to the top of the background panel. I die cut the gift card envelope from Kraft card stock and added a piece of red card stock before adding on the embellished panel. I completed the design by adding a large red gem onto the nose to make the reindeer look like Rudolph. Make sure to head over to the MFT blog for more ideas using all of the new products and for a chance at some of the new release giveaways! Hello and welcome to day 1 of the My Favorite Things November release countdown. All of the new products that we've been sharing all week will be available tonight at 9pm EST! I really wanted to use the light post in the design but the sentiment and the light wouldn't both fit on a regular A2 sized card so I had to go a bit bigger so everything would fit. 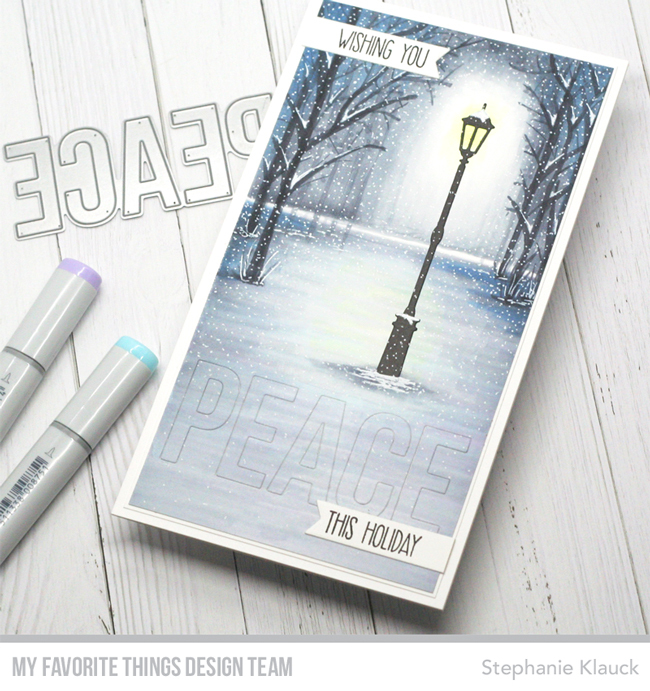 I created the entire background with Copic markers, added the light post with liquid adhesive and then I die cut the word peace from the bottom and expanded on the sentiment using the Dashing Deer stamp set. 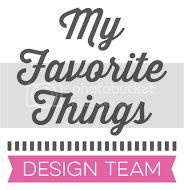 Make sure to head over to the MFT blog to see the rest of the products being revealed today and to see more ideas from the design team using the new stamps and dies. The November release will be available tonight at 9pm EST! Hello and welcome back to the My Favorite Things November release countdown. 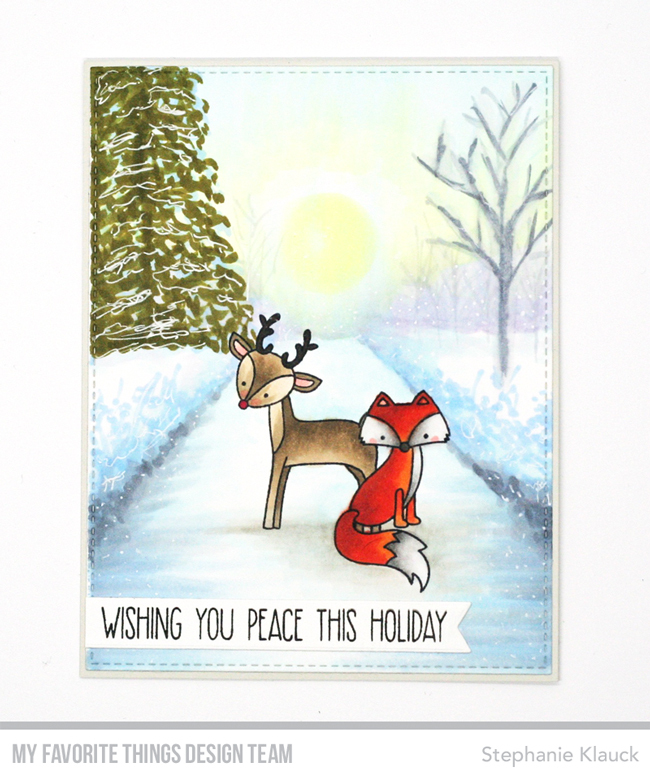 For my card today I decided to create another Copic winter scene using the new Friends in the Forest stamp set. Lately, I've been wanting to use my Copic markers to practice scenes and different backgrounds with my stamped images. I stamped my deer and fox image first, and then I created the scene around them. And the images I stamped were masking gone wrong LOL! I didn't realize until I had already coloured the whole scene and started to colour the animals that I didn't stamp the fox low enough, so it looks like his behind is floating in space haha! 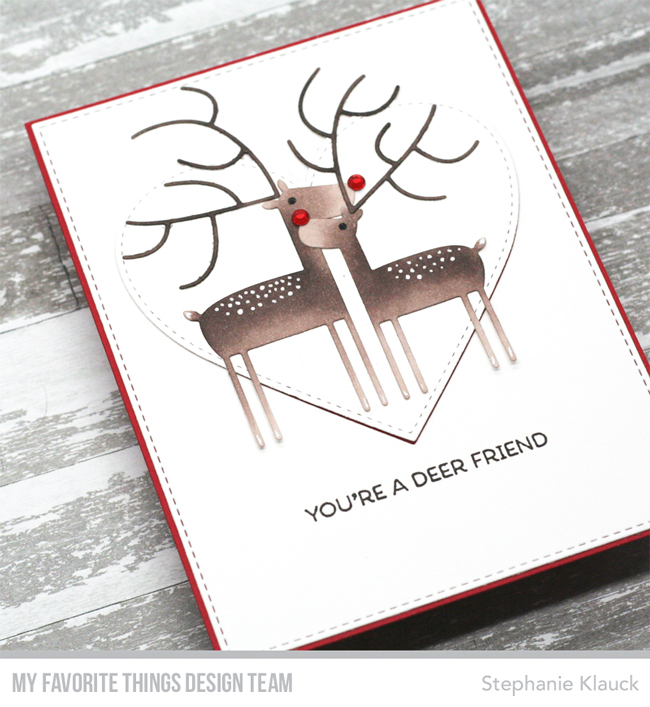 I decided to make my deer Rudolph and gave him a red nose, and then I stamped a sentiment from the Dashing Deer stamp set onto a sentiment banner and added it to the bottom of the card. 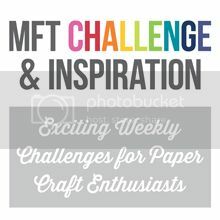 Make sure to head over to the MFT blog to see the rest of the products being revealed today and to see more ideas from the design team using the new stamps and dies. The November release will be available on November 7th at 9pm EST! Hello and welcome back to the My Favorite Things November release countdown. Today we're introducing the newest Birdie Brown set called New Best Friend - an amazing set featuring two adorable girl images, each holding a dog. As much as I love the dogs that the girls are holding, I wanted to experiment and see how it would look to deconstruct the image and have the girl hold something other than a dog. So I stamped her out, coloured her in and then carefully cut her out with my scissors making sure to cut out the dog image. I also stamped a Christmas tree from the Jingle All the Way stamp set, coloured it and also cut it out with my scissors. I cut the arm part of the image so I was able to tuck the tree underneath, and then I strategically placed it so it would cover the part of her face and sweater where the dog images was. I created a Copic scene in the background so it would look like she was out in the woods picking out her Christmas tree and I made sure to colour her in holiday colours so I could make it a holiday-themed card. I finished the card by adding snow detail all over the background and girl images and then I added a sentiment from the Snow Globe Sentiments stamp set stamped onto a white banner. I love how it looks layered over the moon. 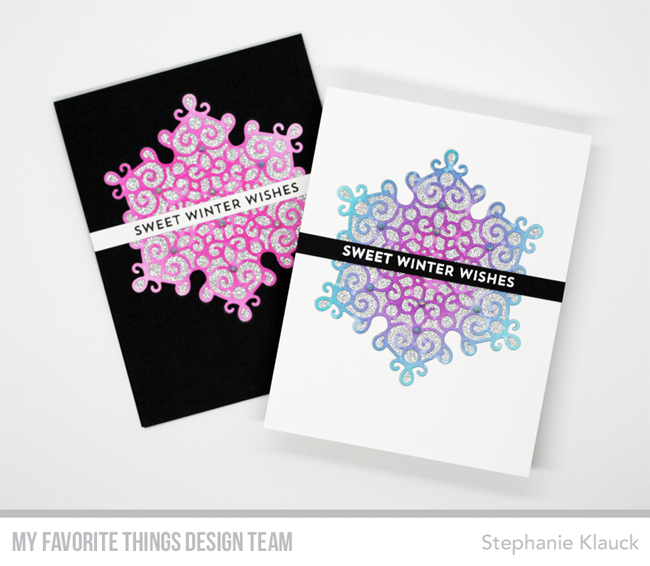 Today we're kicking things off with two super cute winter stamp sets and some gorgeous mandala stamps and dies. 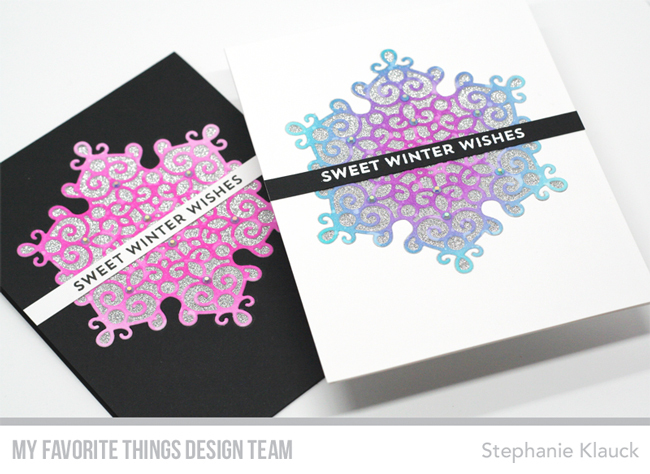 My cards today feature the new Mesmerizing Mandala Die-namics - a gorgeous die that works as a snowflake on a holiday card! I created two inked panels using Distress inks, and then I cut the mandala's from them to create the two snowflakes that I featured on my cards. For one of them I combined Peacock Feathers and Picked Raspberry for a multicolour look and the second one I did completely pink and let it fade a little lighter around the outside edge. Once I had the snowflakes created, I diecut the mandala shape from the front of a white and black card base and backed the openings with Silver Sparkle card stock. I then adhered the die cut pieces into the opening so they would be inlaid into the card front with the silver sparkle showing through. I finished both cards with a sentiment strip across the center of the snowflake and then I added some jewels to the snowflakes for added sparkle and dimension. Hello and welcome back. 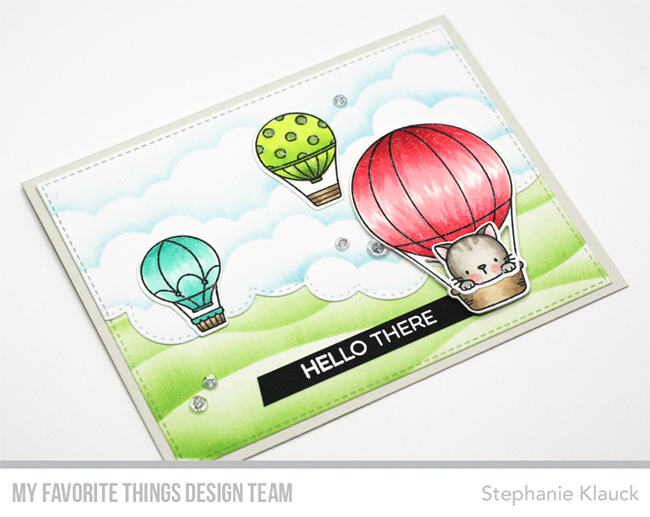 Today I have a card to share for the newest sketch challenge for My Favorite Things. I love having a sketch to start from on a card... they provide a great foundation for the overall design. 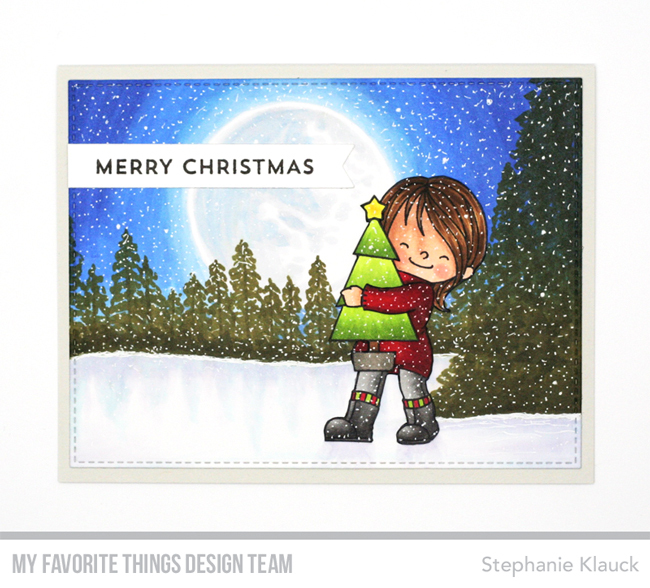 For my card today I used the Merry Everything stamp set and created a holiday themed card based on the sketch. 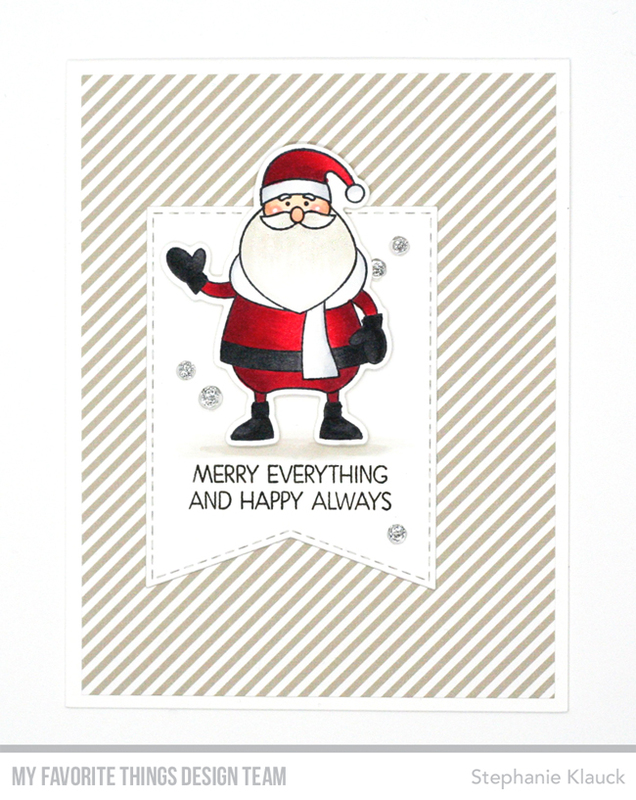 I created a patterned paper background to add some detail to the card and then I layered a fishtail banner and stamped Santa image on top. 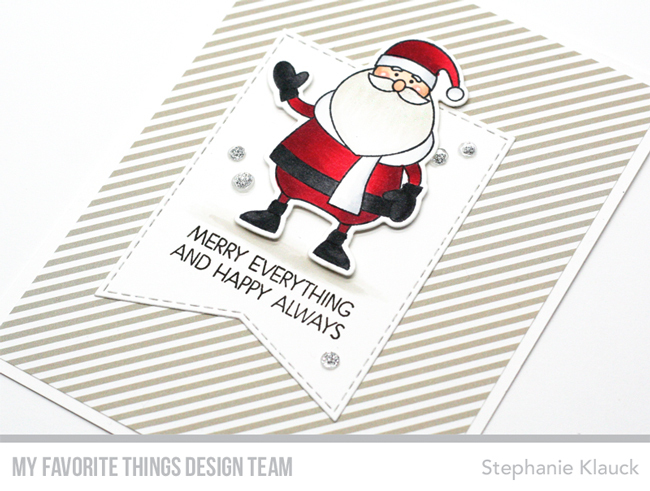 I added the sentiment under the Santa and finished the card with some clear sequins to add a bit of dimension. You can take part in this week's sketch challenge HERE. Every week a randomly chosen winner wins a $50 GC to the MFT online store!